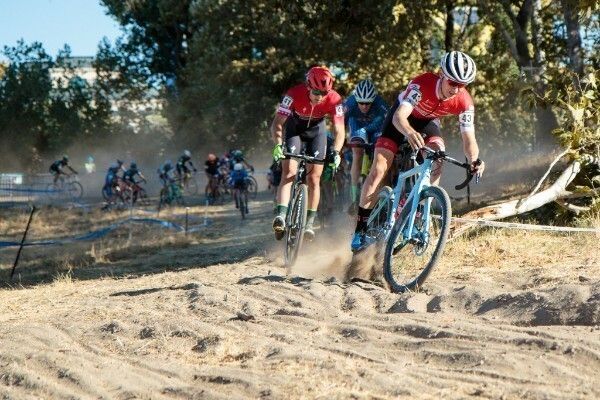 After winning here last year, Lance Haidet was looking forward to getting back to California for the West Sacramento Cyclocross Grand Prix. "As much as love racing in the mud, it's nice to have a high-level UCI race close to home," said Lance who lives in nearby San Luis Obispo. "This is always a fun weekend. The venue is super cool and this year there was a huge crowd. The race promoters always do a great job." The West Sacramento course is always a fast one. "The racing was full gas from the gun, with a solid group of five of us forming within a half lap each day. From then on, it was just attack after attack until the group started to come apart. Because it was so windy, once you were gapped, it was really hard to fight back," said Lance. Lance had great starts both days, but never quite felt like her was at 100% on either day. "I tried my best to hang on to the lead riders as things got spicy, but I could not quite hold on," explained Lance. He dug deep on Saturday to go from 5th to 4th place on the last lap, but on Sunday fell from 3rd to 4th with one to go. Next up for Lance and his team is the U.S. Open of Cyclocross double header in Boulder, CO. Racing takes place at the iconic Valmont Bike Park. It has been raining all week and it looks like we may get some muddy racing action!